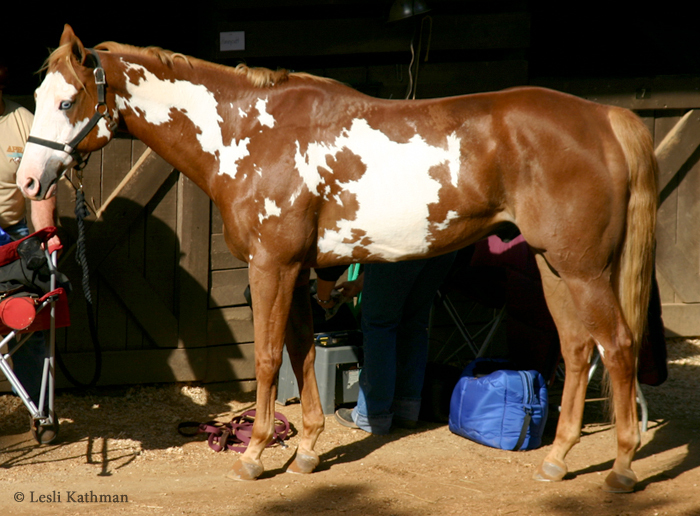 Few posts on this blog have generated as much traffic as the ones about Wing’s Sable Sky, the American Saddlebred with a reversed dappled pattern. (Previous posts about her can be found here and here.) 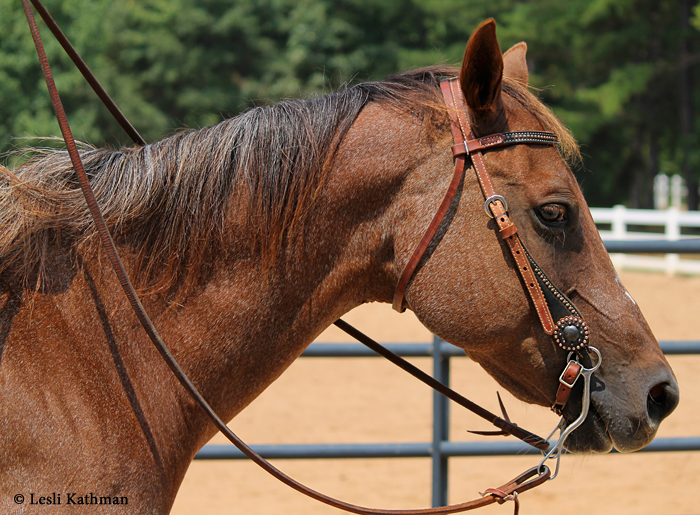 Posts about Sable Sky prompted Julia Bahr to send in photos of her Missouri Foxtrotter Rex’s New Taste of Dallas. 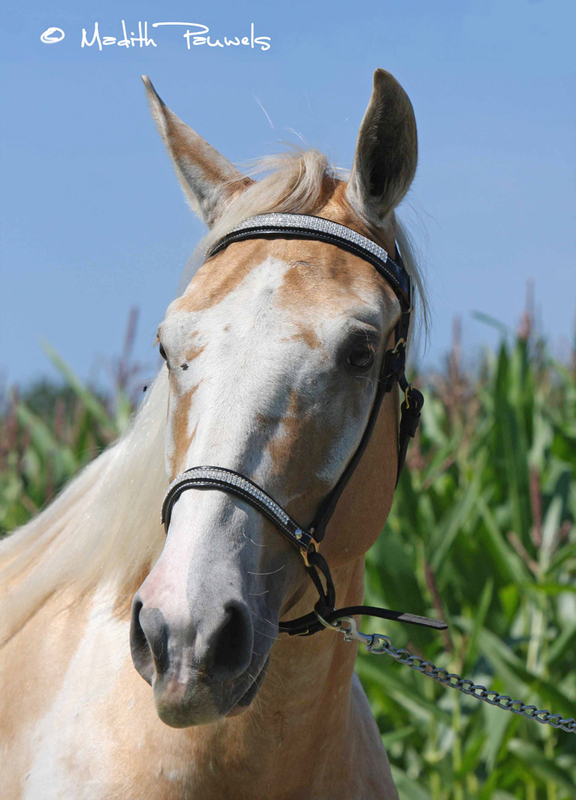 Those images showed the progression of the roaning on Dallas as she aged, but because she is a palomino the effect was more subtle than that on Sable Sky. Pacific Lady Godiva is homozygous for black (EE) and heterozygous at Agouti (Aa). She also tested positive for frame, making her a really good example of just how minimal that pattern can be. (Extremely minimal frames appear to be more common in Miniatures, in my experience.) Just what might be causing her reversed dappling is open to speculation. But is is clear that the pattern developed over time. 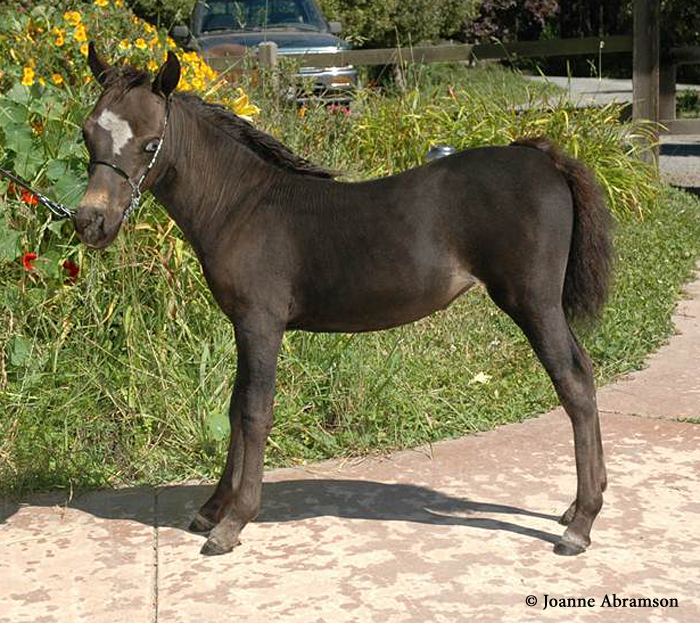 Here she is as a weanling. The early stages of the roaning are visible in these photos of her at age four. Like the Foxtrotter Dallas, the roaning is more pronounced on the face at this point. What I also find interesting about Godiva is that her patterning, at least in photos, is not entirely symmetrical. She is more extensively dappled on her right side than on her left, as these face shots show. I should add that this type of coloring does not really have a name. I have called it “reversed dappled roaning” for lack of any widely accepted terminology. Images of Wing’s Sable Sky – both Dee Dee Murray’s lovely photo and the snapshots that ran with the original Craigslist ad for her – have been widely shared across the internet. Many have called her “giraffe-marked”, which is certainly descriptive. It is also potentially confusing because that term is already widely used, along with the term lacing, for the pattern of reticulated spotting in Miniatures and other breeds. Certainly the pattern on Godiva is similar in location, and lacing is also progressive. It does look a bit different, though. Cindy Evans took this pictures of Ace of Spades, a Miniature with lacing. It is quite possible that his pattern will progress a bit over time, but the way the pattern extends down the sides (and especially on the neck) on Godiva is a bit different. Seeing detailed images of the progression of this pattern was really helpful. I am really interested to see if the patterns on the three horses in these posts – Godiva, Dallas and Sable Sky – get any more extensive with age. I also have to thank all the owners and photographers who are so generous with providing images and information for this blog. You help make putting together this blog such an enjoyable experience! 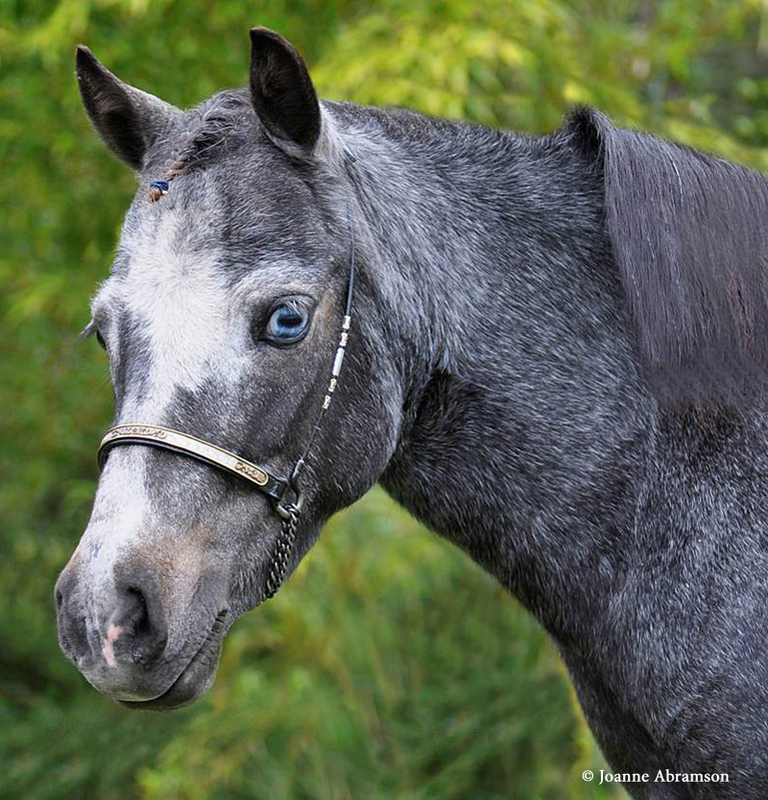 Earlier this year I posted about an unusual Saddlebred mare offered for sale on Craigslist. That mare, Wing’s Sable Sky, generated more interest than almost any other horse posted here on the blog. Since then Dee Dee Murry has taken some professional shots of what I believe is the same mare. This picture shows the odd reversed roaning even more clearly. I also received a note from a Julia Bahr about her Missouri Foxtrotter mare Rex’s New Taste of Dallas. As you can see from this picture, Dallas has the same kind of reversed roaning as Sable Sky. 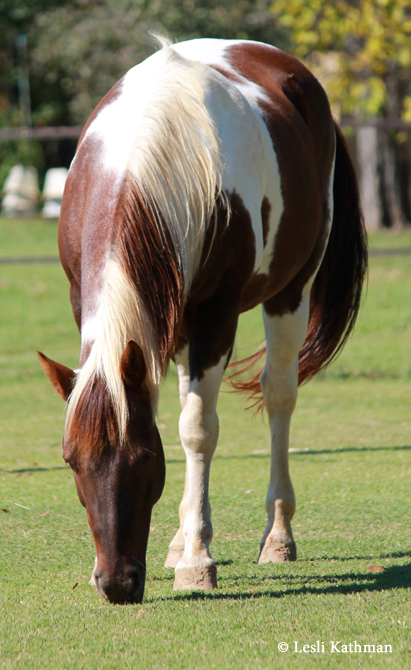 There isn’t as much contrast on Dallas as there is on the Saddlebred mare because of her pale base color, but the arrangement of the roaning is remarkably similar. 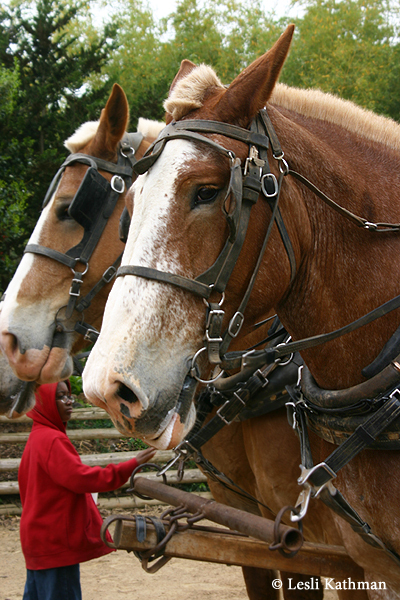 Notice the very pale ears on the Saddlebred, which are also pale on Dallas. There is also a concentration of mottled roaning on the face. Notice how there is a dark line of color on what are otherwise nearly white ears. 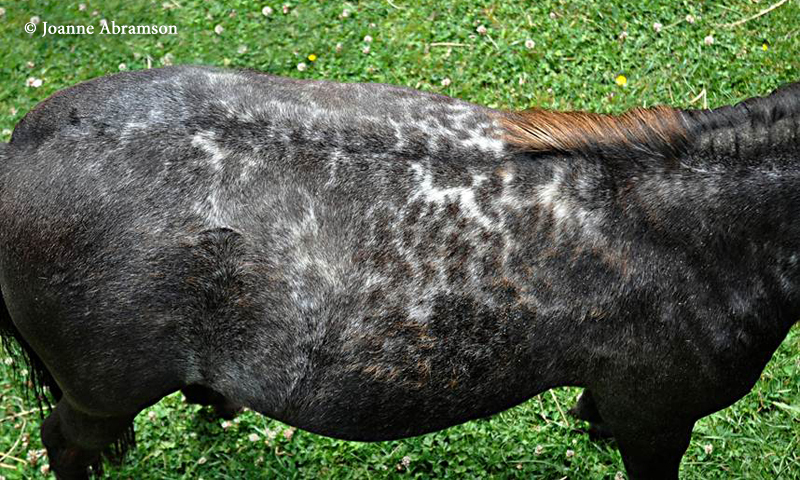 In some ways this is like a reverse of the kind of pale spider lines seen on some dapple greys. That same reversed veining is visible on her stifle, too. Dallas is just two years old in these pictures. 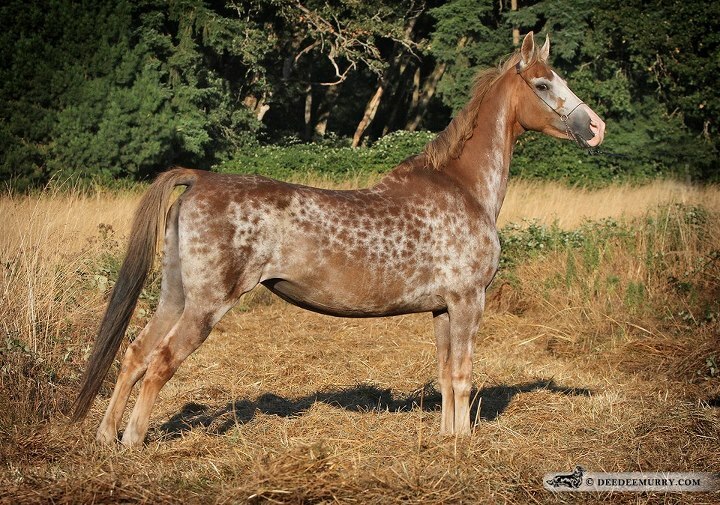 As a foal, she did not look particularly different from any other palomino tobiano, but Julia said that when she began to shed the edge of her blaze became less distinct and she began to develop snowflakes on her face. Now her body coat has begun to dapple. If the mare at the top of the page is in fact Wing’s Sable Sky, she would be nine years old. It seems that whatever this is, it is to some degree progressive. With so few horses to go on, it is hard to know what the range of expression might be. Hopefully more horses with a documented history like Dallas will come to light, and a more complete picture of this type of roaning will emerge. In the meantime, a big thank-you to Julia for sending in the photos! This horse has one copy of the frame mutation. Horses with two copies of the mutation are not viable. So what does this have to do with the KIT mutations? In the comments section, there was speculation of the last post about whether or not mutations could crossover, resulting in a single gene with two separate mutations, rather than two separate genes with one mutation on each. Not asked, but an equally valid question, is whether or not a gene that already contained a known mutation could mutate again. If either were to happen, the next question would be could the situation result in a viable embryo? Would the added layer of impairment change the coloring, or would it damage or even destroy the organism? Have we not yet seen a horse with three KIT mutations (one on one gene, two on the other) because the statistical chances are infinitesimally small, or because the function of some gene is too compromised to result in a viable embryo? I have wanted to bring up a more technical aspect of horse color for a while, but have struggled with the best way to present the information. Part of the problem is that the way we talk about horse color is misleading. For this to make any sense, I will have to clarify some terms. 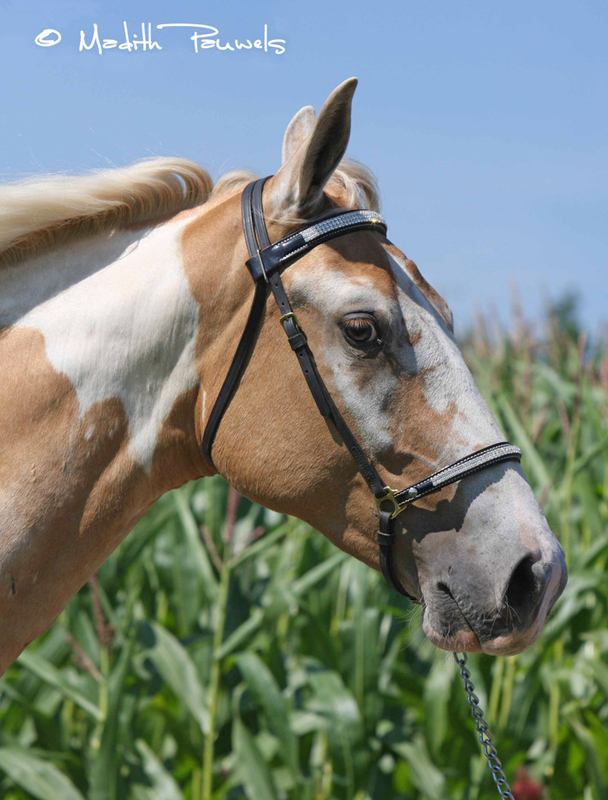 We often talk about horse colors as if they are genes. We say, then, that a horse like the one pictured above has one copy of the “sabino gene” and one copy of the “tobiano gene”. It is true that the “torn tissue” look to his pattern is very typical of what a horse looks like when it has both Sabino1 and Tobiano. He is a Spotted Saddler, so he would likely test positive for each color. Saying he has the Sabino1 gene and the Tobiano gene is a simple way to get that idea across. The trouble is that there is not a specific Sabino1 gene. There isn’t a Tobiano gene. 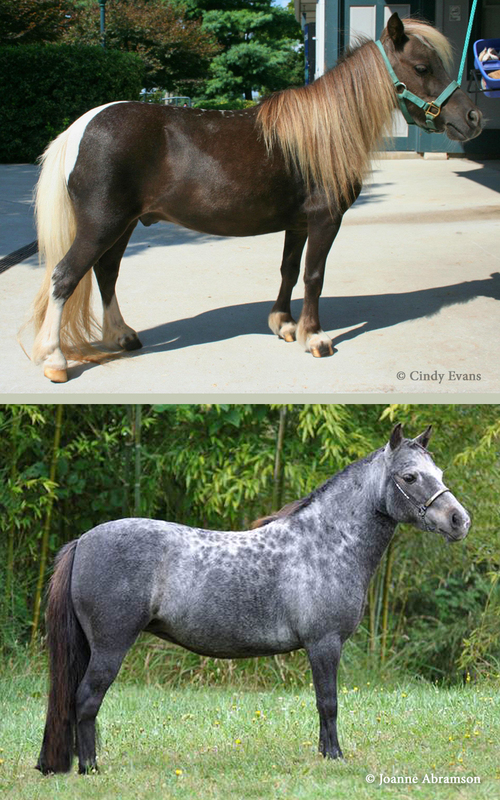 Sabino1 and Tobiano are mutations of an existing gene. When we say that a horse has the “tobiano gene” or the “not-tobiano gene”, what we really mean is that the gene that was there from the start is either mutated (tobiano) or not mutated (non-tobiano). This makes sense when you think about it. Why would an organism carry around a gene that is essentially the absence of a trait? This might seem like semantics, except that some of what we think of as separate colors occur on the same actual gene. They are different mutations, but they share a location. In the case of Sabino1, the mutation occurred on a gene known as KIT. 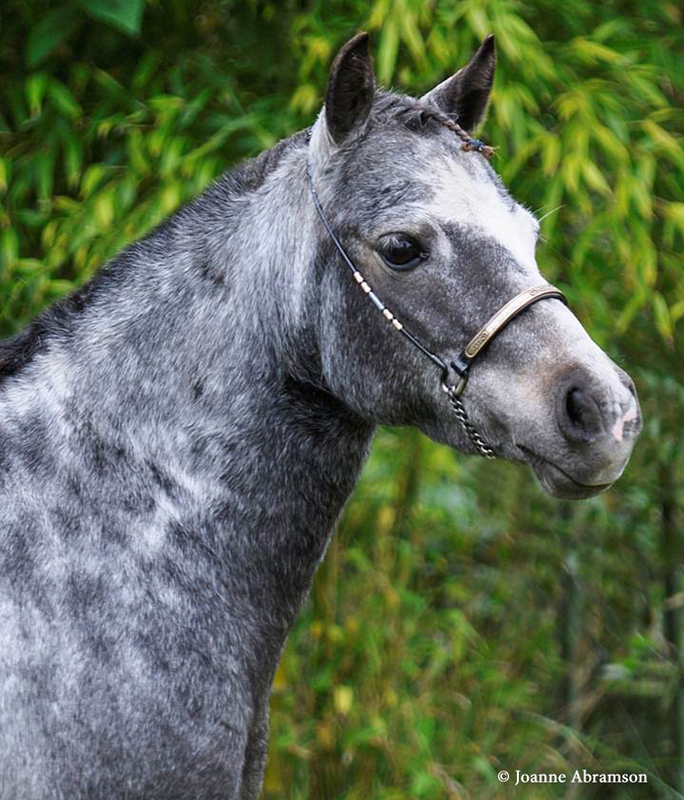 Other mutations found on or very close to KIT are tobiano, true roan and dominant white. This might not seem important until you remember that an animal has two copies of any given gene, one from each parent. It can only give one to any individual offspring. 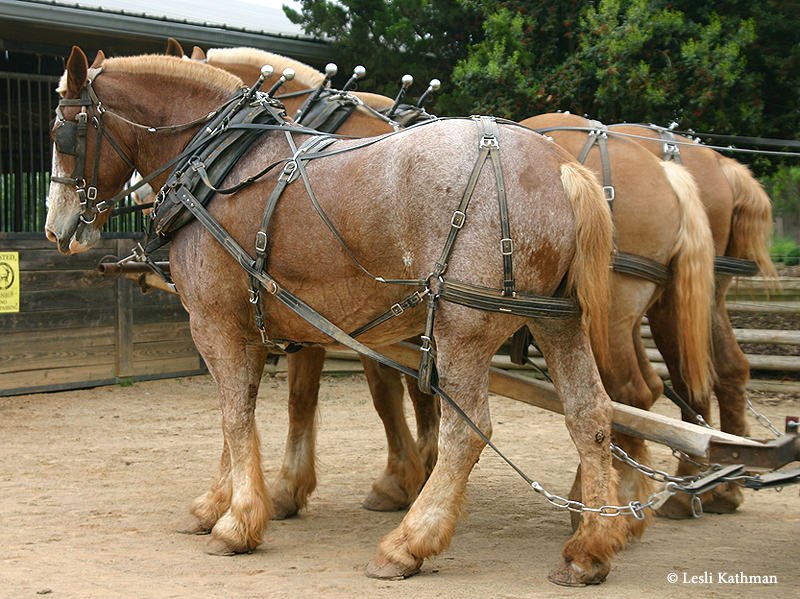 If a horse only has two KIT genes, then it can only carry two mutations – one on each copy of the gene. That means you only have two slots to fill with KIT mutations. 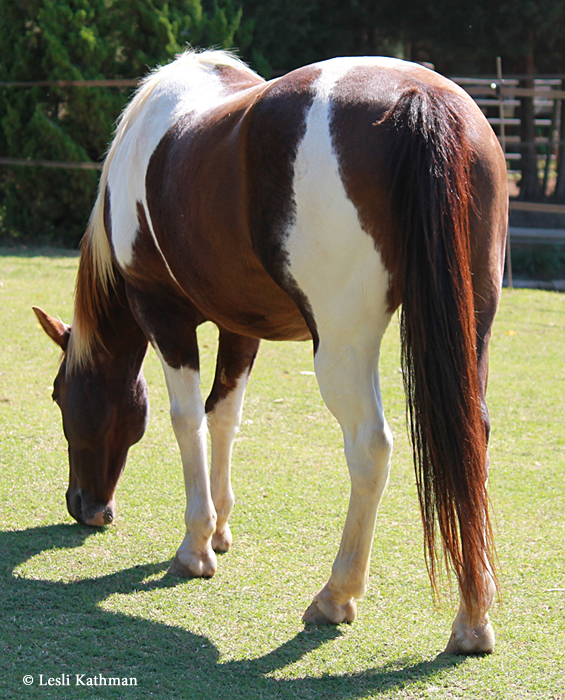 A horse could be homozygous for tobiano, but then he could not also carry Sabino1. His two KIT slots are already filled. This probably makes more sense when it is understood that most color mutations are one-time events that happened a very long time ago. Sabino1 has been documented in Siberia in the early Bronze Age, so it is at least that old. Horses like the one pictured here descend in an unbroken line from whatever early ancestor carried that first Sabino1 mutation. One of his KIT genes is that same gene with that same mutation. 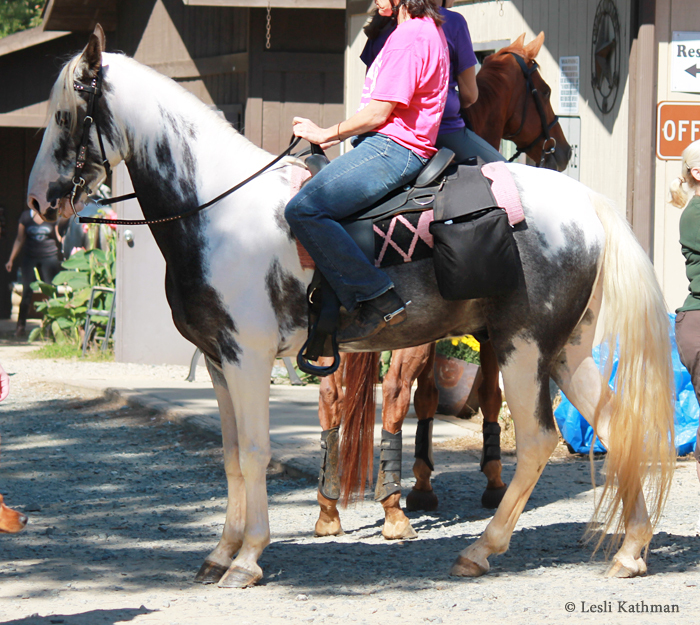 His other KIT gene comes from the whatever horse carried the first tobiano mutation. That pattern has been found in Eastern Europe later in the Bronze Age, so like Sabino1 it is really old. Were he not a gelding, he could in turn pass on one of those – either tobiano or sabino1 – to his offspring. One, but not both. This has implications for artists like myself because we tend to mix-and-match the details of different patterns to get certain visual effects. What we have to be careful about is whether or not the limitations of gene locations make something impossible. 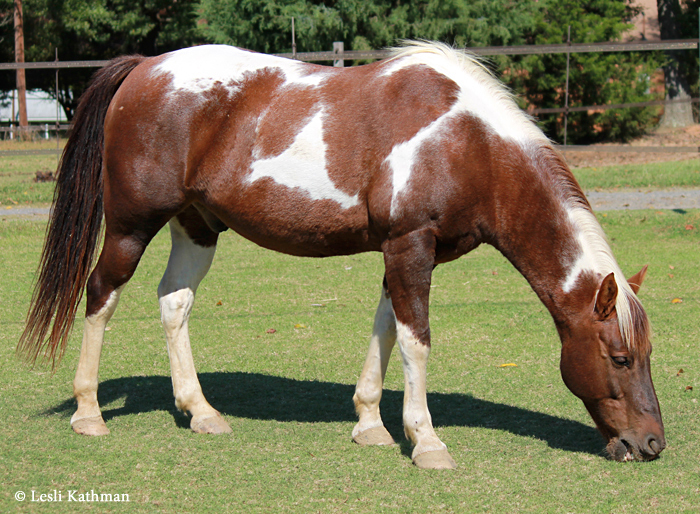 If a horse can only carry two KIT mutations, and true roan and tobiano prove to be on KIT or linked to KIT, then is a homozygous tobiano roan possible? 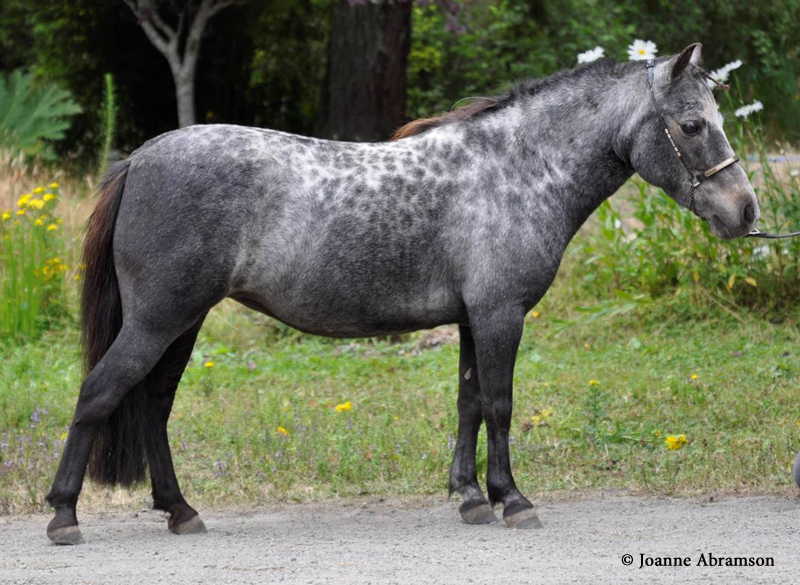 Is a roan tobiano with cat track markings – a trait closely associated with homozygosity in tobianos – accurate? And what about the other colors and patterns that have not been mapped to a specific location? What conflicts will become apparent when more mutations have known locations? 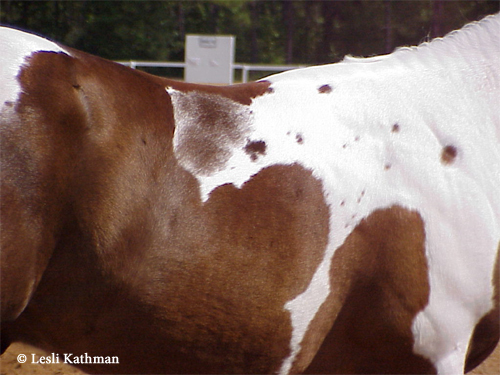 We know, for instance, that the leopard complex gene (varnish roan) is not located on KIT, but what about the patterning genes that work with leopard complex to make the more vivid appaloosa patterns? It is often assumed that all combinations are possible, though they might be so rare that actual living animals cannot be found with them. That is probably a mistaken assumption, with some combinations not possible because of location conflicts. This also has implications for people who study horse color. Homozygous tobianos are an interesting example because they obviously have two KIT-related mutations. Still a high percentage of homozygous tobianos have face markings. The commonly accepted wisdom is that tobiano by itself will not place white on the face, yet KIT is often assumed to be involved in ordinary face markings as well as the sabino patterns. Does the fact that many homozygous tobianos have broad blazes suggest that some sabino patterns are not, in fact, located on KIT? 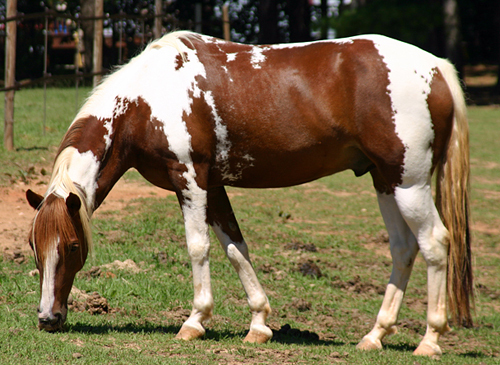 Or does it suggest that in its homozygous state, tobiano does start to place white on the face? It is also important to breeders, who may find that attractive combinations do not necessarily breed true. Many Paint Horse breeders have already noted this situation with roan tobianos. Roan has not yet been definitively mapped, and it is thought to be close to KIT rather than on KIT. Still genes that sit close to one another tend to travel as a package, and that is definitely the case with roan and KIT. 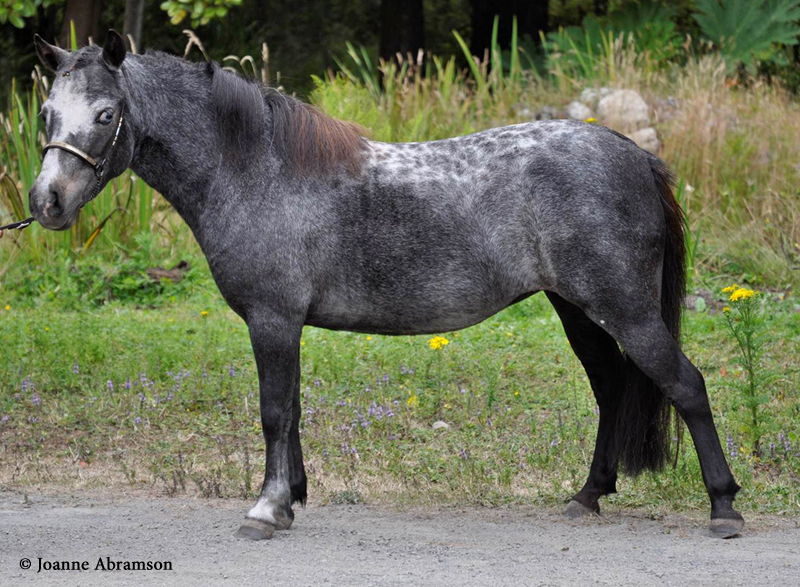 Roan tobianos typically have a roan parent and a tobiano parent, and they usually pass along either roan or tobiano to their foals, but not both. Gene location is pretty technical stuff, but the information has a lot of practical uses. I have one last variety of roaning to share. 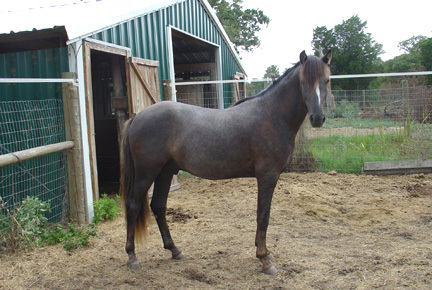 The mare in these photos is a Quarter Horse, and is what is often called a frosty roan. 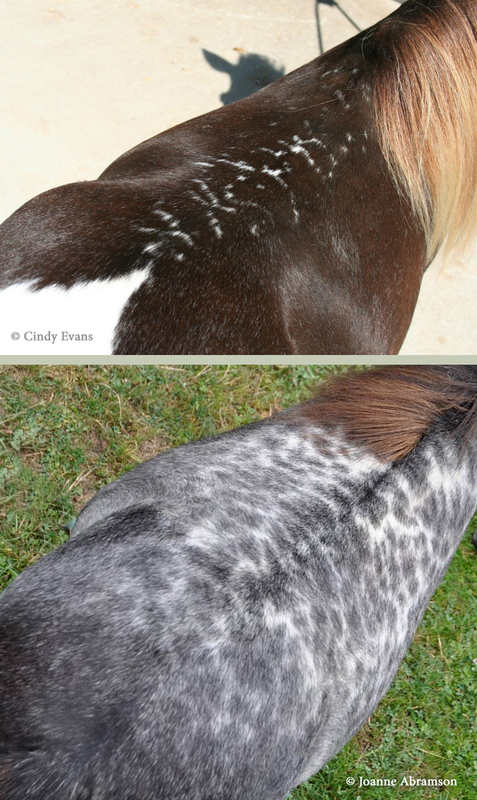 Like true, dark-headed roans, frosty roans have white hairs mixed in a dark coat, but unlike the true roan the hair is not evenly distributed. 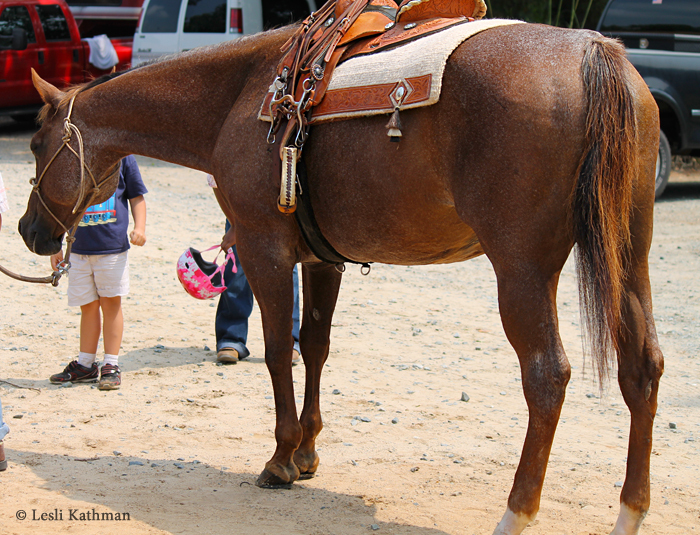 Instead it tends to concentrate more heavily on the topline, including the mane and tail. 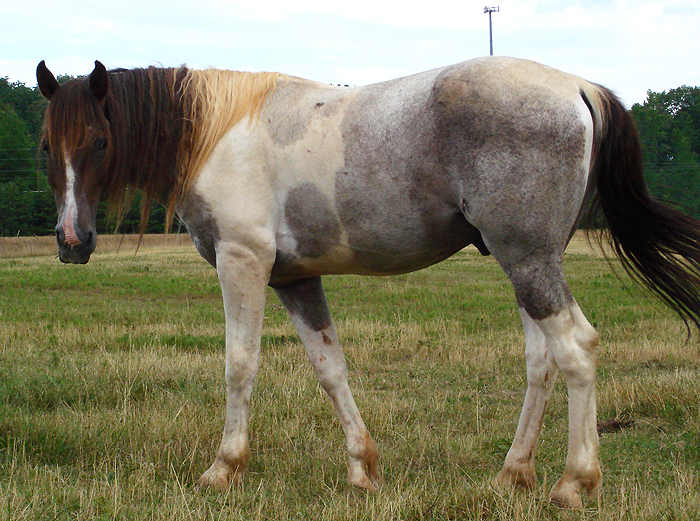 On a true roan, the mane and tail remain dark. There are also concentrations of white hairs where the bones are more prominent. 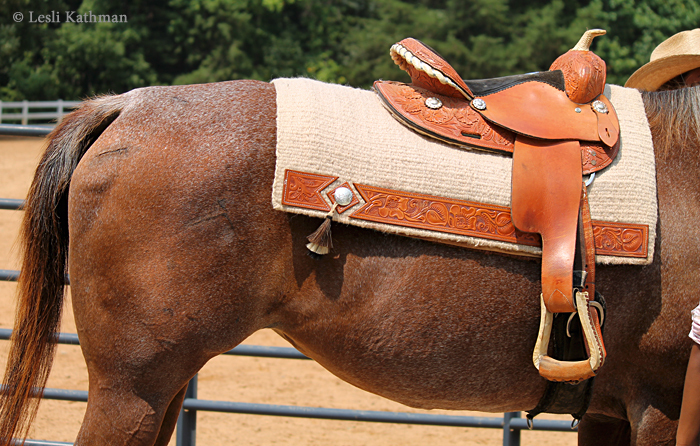 It’s hard to see because of the shadows cast by her saddle, but notice the pale area over her elbow. This can be seen on her hocks, too. 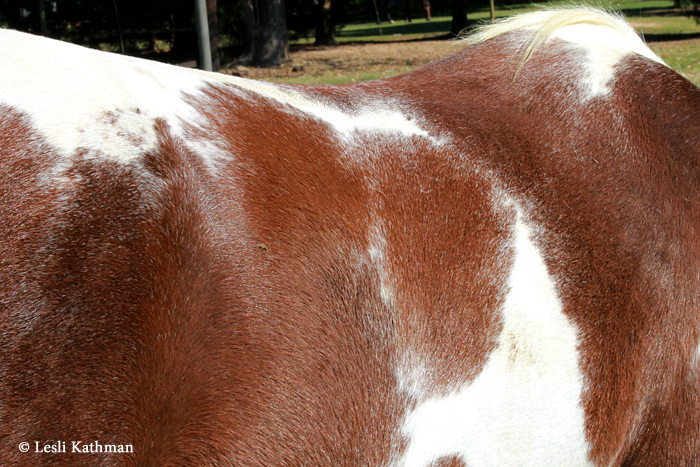 In this way, frosty roans display the opposite pattern of white hairs than a varnish roan, which tends to retain color across the bony ridges. Here is a varish face with dark nasal bones and roaning on the rest of the face. 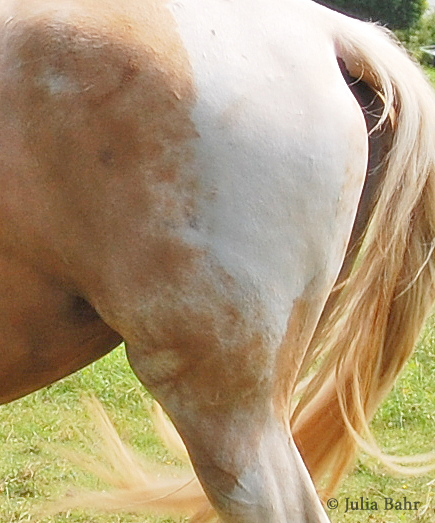 Varnish roans typically have paler hindquarters, but the other areas where a frosty would be pale, a varnish tends to be darker. Here is the body of a varnish roan, showing how the jaw, elbows and the hocks are darker. 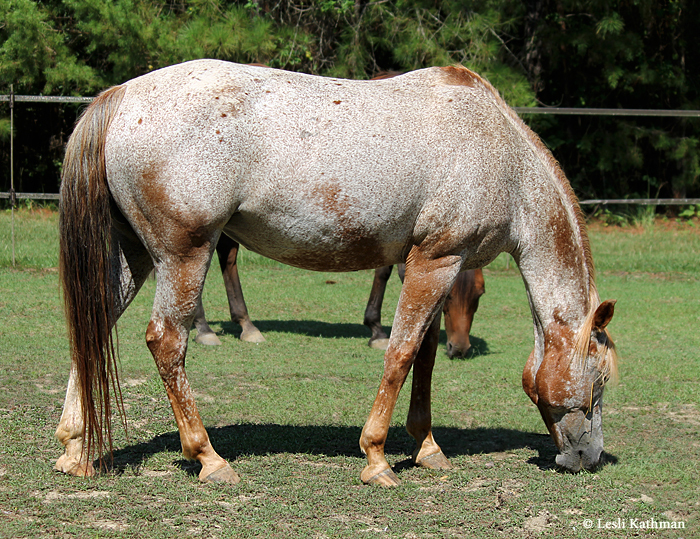 It is not unusual for visually similar colors, like roan and frosty roan, to end up combined in a population. 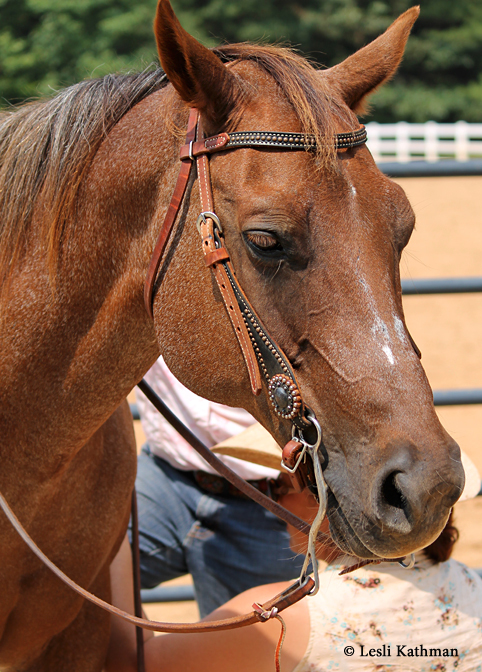 When breeders find a given color appealing, there is often a bias towards selecting horses that have that color – or something that looks a lot like it. That is how breeders of “golden” Saddlebreds ended up with both champagne and palomino horses in their breeding programs. 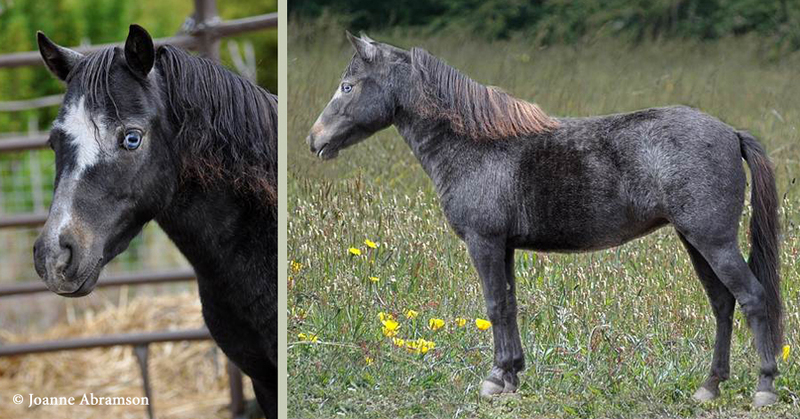 Having two (or more) different genes that produce similar effects can also increase the chance that foals have the desired color, because each gene is a separate chance to get the desired look. Unfortunately for those interested in horse color research, it can also make sorting out the underlying causes a lot harder. 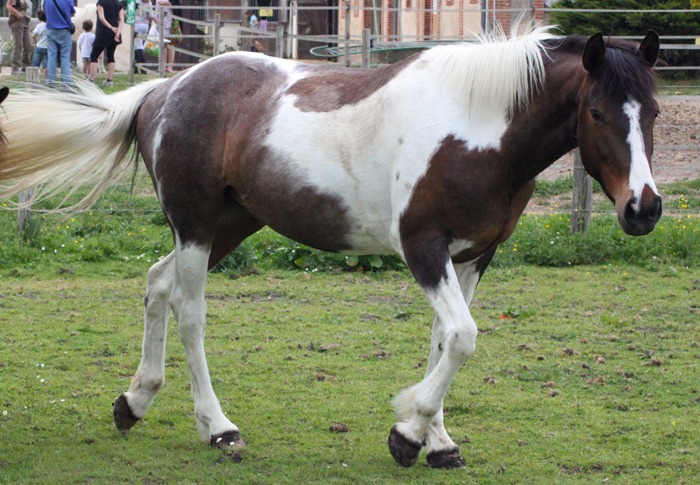 Another kind of roaning that is often attributed to the sabino gene is the kind seen on this chestnut tobiano pony, Dexter. This has a softer look than the “laced” edges that Dexter’s sabino-tobiano stablemate Splash has. What makes Dexter unusual, though, is that he has a solid face. 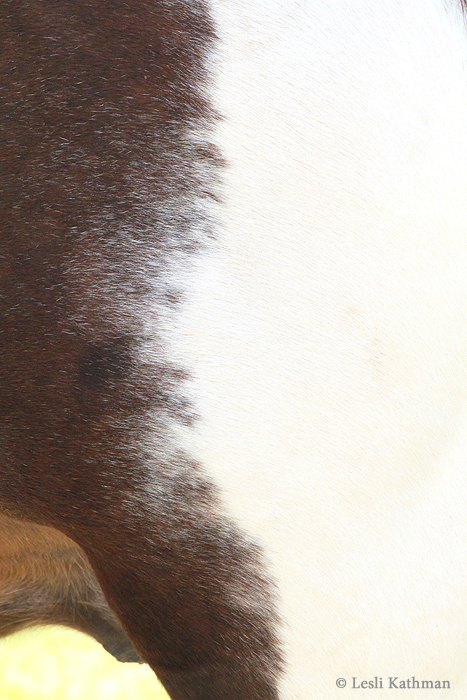 Here is a close-up of another roan tobiano. Notice how the roaning is evenly distributed across the spots. Now compare that to a close-up of Dexter’s hip. It’s also different from the roan patches that are sometimes seen on tobianos, particularly homozygous tobianos like the one below. Those tend to be rather random, whereas the roaning on horses like Dexter are concentrated around the borders of the dark patches. Here is a close-up of roughly the same area on Dexter. 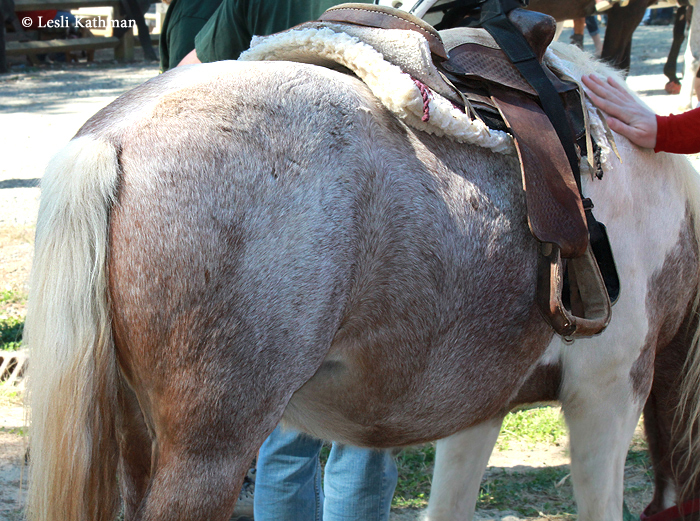 Roan and sabino tend to be catch-all terms for horses that have white hairs or white markings. 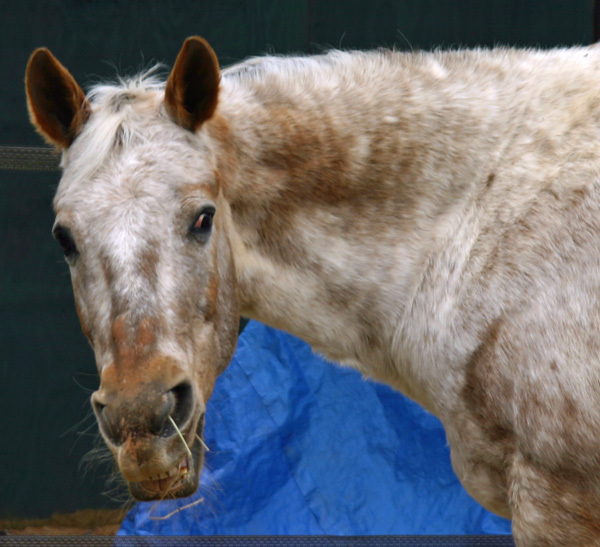 In the next few posts I wanted to share a few horses that a generation ago would simply have been called roan, but that have white hairs or ticking from something other than the true, dark-headed roan gene. 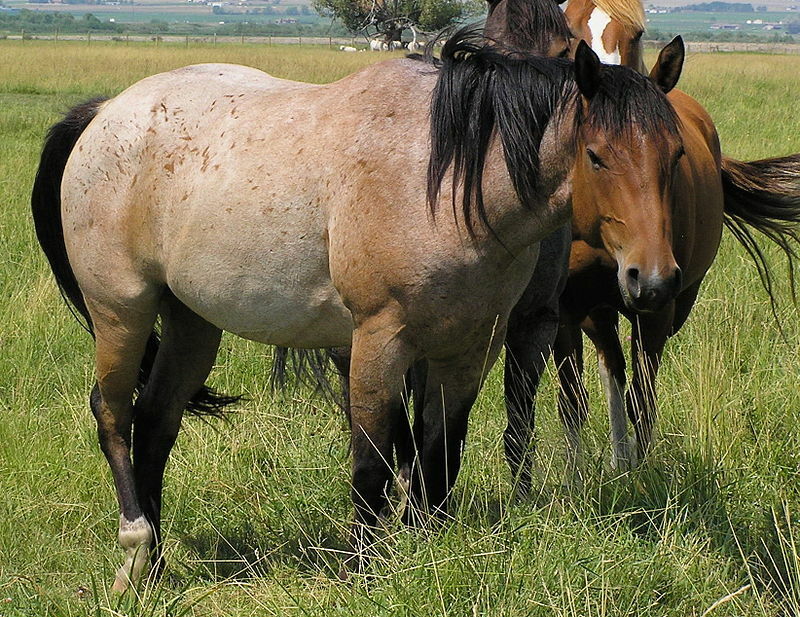 The general convention now is to group horses like that in with the sabinos, but their actual relationship to the sabino patterns is not really known. The upside-down “V” formed by the dark points on his front legs, which is one of the hallmarks of the true roan pattern, is particularly visible in the video. This Belgian does not have those, even though his front socks do not extend far up his legs. Notice, too, that the roaning not only extends into areas that would be dark on a true roan (like the face and lower legs), but it is quite uneven. His neck, for instance, shows very little roaning. Even more interesting are his hindquarters, which have patches of less intense roaning. For those artists familiar with etching to achieve roaning effects, it looks like the person doing his pattern got bored with the process by the time they reached his bum! These kinds of revertent patches are pretty common in sabino roans. He also had an unusual roaned patch on the border of one side of his blaze. I suspect that a lot of the Belgians (of American breeding at least) registered as chestnut roan in the last fifty years are in fact sabinos like this guy. He isn’t that unusual, as sabino roans go. What is interesting is that it seems possible to get sabinos where there are fewer indicators that the pattern is there beyond the roaning. There are a number of instances where horses from sabino families have body roaning and a blaze, but no other white markings. 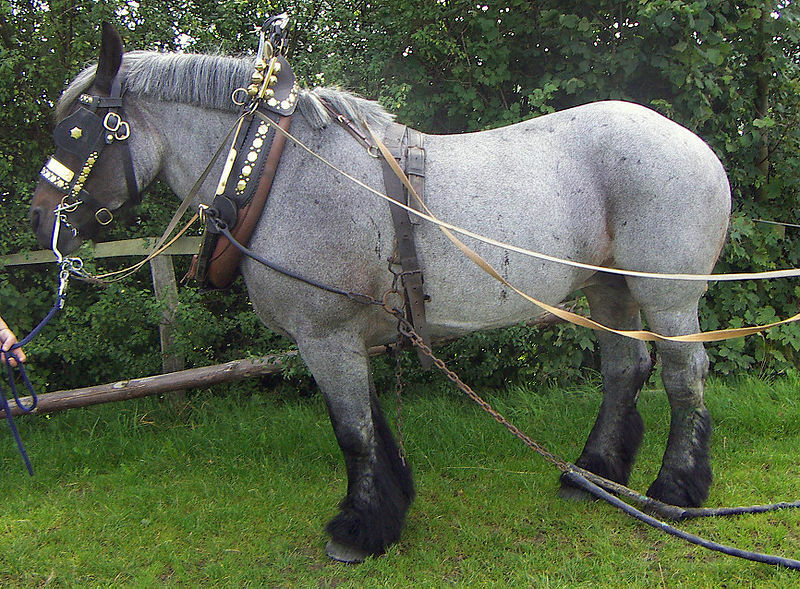 In some breeds horses with all-over roaning and a blaze (or having even less white on the face) have been tested to carry Sabino1, the only form of sabino that can be tested at this point. 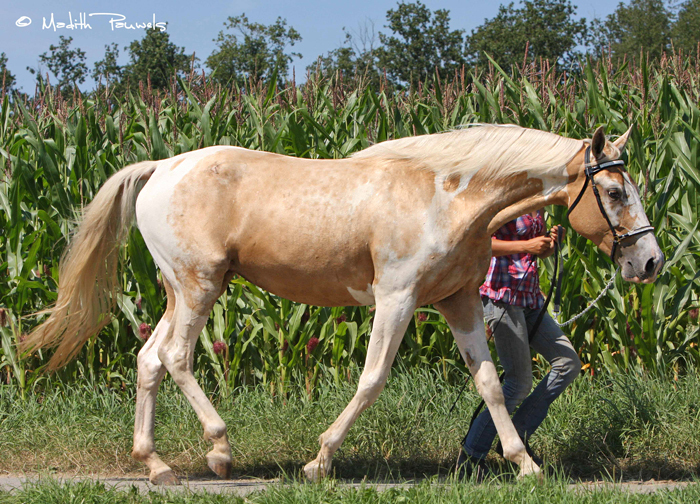 Belgians are not known to carry Sabino1, though it’s also true that testing has not been widely done among many of the draft breeds, with the exception of the Gypsy Horse. What we call sabino is in fact a lot of different types of patterns. Those patterns can be sorted out visually, as I did in the upcoming book, but it may be that those visual categories include different genetic colors that sometimes mimic each other.